Following on from Janet Birkmyre’s article “ithlete Pro Explained“, the TORQ Track Cycling Team riders tell us how this amazing tool has helped them with their personal training. For 2016 the team will get even smarter with their use of HRV data by using the ithlete Team App, which will hold all the data for each team member in one place, so that team coach, Chris Davis, can look at it anytime he needs to. This will allow for even greater personalisation of training plans and more individual tapers before big events as well. We have already discussed what ithlete does here, ithlete Pro Explained, and now we want to talk about how the TORQ Track Cycling Team take their daily readings, how they use this information and insights they gain from this incredibly powerful tool. 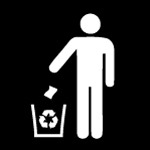 Q When do you take your readings? Mel: I take my HRV as soon as I wake up. I quickly lock myself in the bathroom before the toddlers have realised I am up and can come and hound me – I have to be pretty sneaky! I am sitting down when I take the reading. Louise: I take my readings first thing in the morning, straight after waking up, while I am still in bed. The only movement I make is to pick up the heart rate strap. Jan: I get up and have a glass of water. Then I let Harry (the cat) out and take my reading while standing and waiting for the kettle to boil. Apparently it all works even if you don’t have a cat! Q And what hardware are you using? Mel: Finger sensor with iPhone. Jan and Louise: the ithlete Bluetooth heart rate strap and an iPhone. Q How easy was it to get started with taking the measurements?  The team agreed with Mel, who said, “it is ridiculously easy, even for a technophobe! I downloaded the app, plugged it in and was off. I‘ve had no problems taking readings either”. Q Are you aware of what influences your HRV measurements and what do you do with the information? Mel: I have learned that nerves are a big factor in influencing my HRV and I often have a low HRV reading and a red light on the morning of a big race – that was unnerving at first but I’m used to it now. Other than that, a single low HRV number and ithlete amber warning often means I haven’t hydrated properly, eaten enough after training hard, or perhaps I’ve had a bad night’s sleep. If I get a couple of amber warnings back to back, I know I am in trouble and I need to back off the training to let my body recover. Using the readings like this, I have managed to keep much healthier this year; it has been a revelation and I am not sure how I ever managed to train and race without it. I guess it helps that my coach is smart enough to understand how important HRV is in keeping me healthy and so we both work with the numbers and advice from ithlete. Louise: I was quite stubborn at first and did not want to change my training, even though ithlete told me I should. A few months back, my readings were already low and I had not been feeling well, but I pushed on. Then the readings dropped again and quite suddenly I felt very ill. The next thing I knew I was in hospital and was diagnosed with a blood clot on the brain – now I take my readings very seriously and follow the advice given. 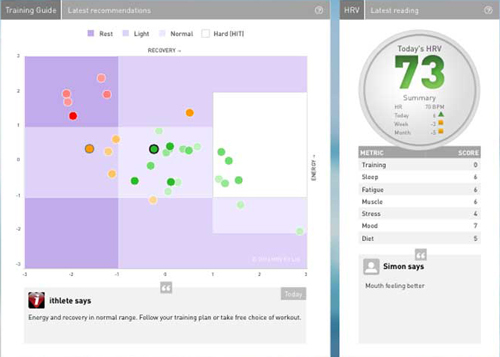 Jan: My HRV numbers seem to react to training load, sleep, hydration and general health. In the past I have seen it drop like a stone just before I get ill, or I have pushed through an amber warning when I have known that I am not 100% and guess what, I’ve got ill! I learnt that lesson pretty quickly and these days I manage to train harder and more consistently than I did before I used ithlete to guide me. The ithlete Training Guide now rules my day. I look at it immediately after taking my HRV in the morning and, in my experience, the bubbles have been an accurate reflection of how I feel, so I take the advice given and rest, take an easy training option or hit it hard. 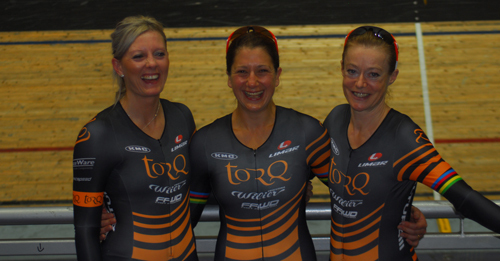 In 2015 the TORQ Track Cycling Team scored some big wins, not least of which were the performances at the World Masters Championships, where the team picked up medals in every event they started and took an incredible six World Masters titles. Stand out performances included the two stunning personal bests that Louise rode in the individual pursuit, while Mel and Jan were part of the team that set a new World Masters record in the Team Pursuit. Outside of this, Jan won the National Omnium series again this year and notched up her third Elite National Title in taking the Derny Championships for the second time. 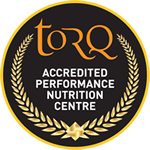 The TORQ Track Cycling Team is made up of riders who are not content to settle for “marginal” gains, and so we were thrilled to be working with ithlete and to see riders make a step change in their performances as a result.